112 n Performance & Hotrod Business n April 2015 ONE MORE THING... 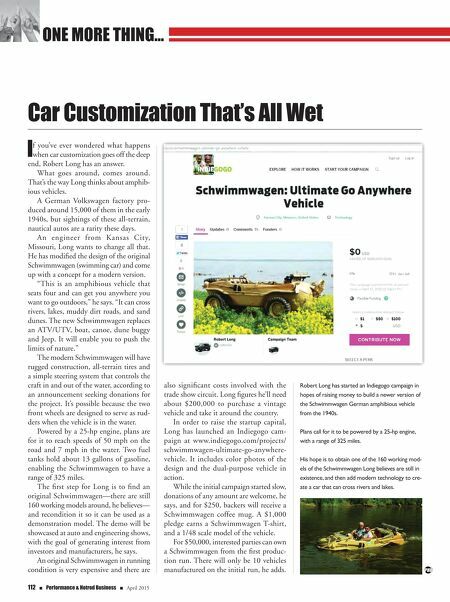 Car Customization That's All Wet I f you've ever wondered what happens when car customization goes off the deep end, Robert Long has an answer. What goes around, comes around. That's the way Long thinks about amphib- ious vehicles. A German Volkswagen factory pro- duced around 15,000 of them in the early 1940s, but sightings of these all-terrain, nautical autos are a rarity these days. An engineer from Kansas City, Missouri, Long wants to change all that. He has modified the design of the original Schwimmwagen (swimming car) and come up with a concept for a modern version. "This is an amphibious vehicle that seats four and can get you anywhere you want to go outdoors," he says. 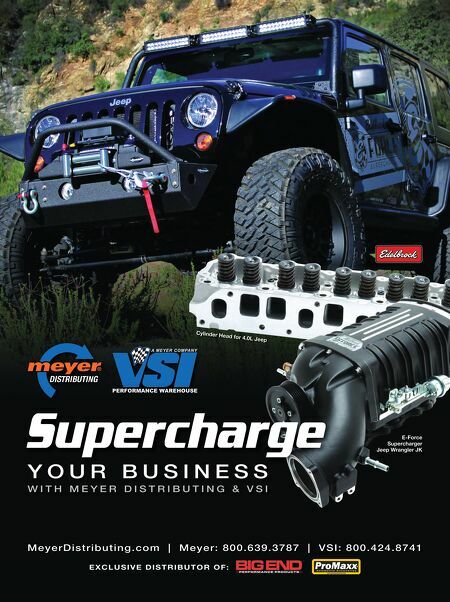 "It can cross rivers, lakes, muddy dirt roads, and sand dunes. The new Schwimmwagen replaces an ATV/UTV, boat, canoe, dune buggy and Jeep. It will enable you to push the limits of nature." The modern Schwimmwagen will have rugged construction, all-terrain tires and a simple steering system that controls the craft in and out of the water, according to an announcement seeking donations for the project. It's possible because the two front wheels are designed to serve as rud- ders when the vehicle is in the water. Powered by a 25-hp engine, plans are for it to reach speeds of 50 mph on the road and 7 mph in the water. Two fuel tanks hold about 13 gallons of gasoline, enabling the Schwimmwagen to have a range of 325 miles. The first step for Long is to find an original Schwimmwagen—there are still 160 working models around, he believes— and recondition it so it can be used as a demonstration model. The demo will be showcased at auto and engineering shows, with the goal of generating interest from investors and manufacturers, he says. An original Schwimmwagen in running condition is very expensive and there are also significant costs involved with the trade show circuit. Long figures he'll need about $200,000 to purchase a vintage vehicle and take it around the country. In order to raise the startup capital, Long has launched an Indiegogo cam- paign at www.indiegogo.com/projects/ schwimmwagen-ultimate-go-anywhere- vehicle. It includes color photos of the design and the dual-purpose vehicle in action. While the initial campaign started slow, donations of any amount are welcome, he says, and for $250, backers will receive a Schwimmwagen coffee mug. A $1,000 pledge earns a Schwimmwagen T-shirt, and a 1/48 scale model of the vehicle. For $50,000, interested parties can own a Schwimmwagen from the first produc- tion run. There will only be 10 vehicles manufactured on the initial run, he adds. Robert Long has started an Indiegogo campaign in hopes of raising money to build a newer version of the Schwimmwagen German amphibious vehicle from the 1940s. Plans call for it to be powered by a 25-hp engine, with a range of 325 miles. His hope is to obtain one of the 160 working mod- els of the Schwimmwagen Long believes are still in existence, and then add modern technology to cre- ate a car that can cross rivers and lakes.